The occurrence of plucking or of hydraulic bedrock frost heave raises the issue of how ice pressure is transferred through bedrock. Clearly, the pressure is transferred via the motion of water molecules, and unless the bedrock has an open porous structure, the water molecules must move through a joint system (see exception below). There is little evidence of bedrock possessing an open porous structure in the areas of Heart of Avalonia where plucking and bedrock frost heave are commonly observed. All of the areas, however, have well developed joint systems of tectonic origin. One source of ambiguity in arguing that joints, not porosity, convey H20 through bedrock lies in rock possessing a slaty or schistose texture. In these rocks, it is possible that water molecules would migrate along planes parallel to the cleavage and the rock would then appear to have a 2-dimensional open porosity even in the absence of recognizable joint planes. The discussion presented below relating to joints may also pertain to water molecules moving between layers in slaty or schistose rock. Assuming that water molecules move through a bedrock joint, the key questions become: 1) What are the characteristics of the joint? and 2) What state are the water molecules in? The second question is readily answered for the case of plucking by a warm-based glacier. The water molecules are in the liquid state. It is more difficult to answer the second question for the case where bedrock is frozen. Is frozen bedrock impermeable? Observations suggesting the occurrence of hydraulic bedrock frost heave beneath thick cold-based glacial ice suggest that frozen bedrock is not 100% impermeable to water transport. A joint consists of a plane in rock where all crystals constituting the rock terminate and do not extend across the plane. In theory, a joint could have a width of molecular dimensions. In practice the stress responsible for causing a joint to form and propagate would likely induce strains near the joint that would interfere with conformity between the two sides of the joint plane. A lack of conformity would lead to the joint widening to macro dimensions. Joints seen in rocks in the glacially disrupted bedrock areas of Heart of Avalonia invariably show evidence of penetration by groundwater. The presence of groundwater is indicated by changes to the appearance (color, luster) of joint surfaces as compared with fresh fracture surfaces formed when a rock is broken for inspection. Groundwater intrusion provides evidence of a joint widened to macro dimensions. Cleavage planes in slaty or schistose rock typically lack indications of groundwater penetration. The Gibbs-Thomson effect is qualitatively expressed as the tendency for water molecules not to form crystals when the molecules are confined between surfaces (see also Properties of Ice, Mechanisms for Bedrock Frost Heave, Periglacial Processes). The effect becomes significant when the confining surfaces make interactions between water molecules and surface (non-water) molecules more thermodynamically significant than interactions between the water molecules themselves. The resulting barrier to crystallization allows water to remain in a noncrystalline (unfrozen) state, even at temperatures well below freezing. While the Gibbs-Thomson effect is easily demonstrated in fine-grained soil, it is less clear exactly how it operates in joints in bedrock. Where a joint is widened to dimensions far exceeding molecular dimensions, the effectiveness of the Gibbs-Thomson effect at reducing the freezing point would seemingly be limited or negligible. However, the Gibbs-Thomson effect still functions at the boundary between crystallized water in the central regions of a joint and the rock forming the sides of the joint. The question then becomes: What is the impact of the Gibbs-Thomson effect on mobility of water molecules moving in a joint? Water that has crystallized can move only by creep, a process that rapidly becomes less effective as a confining channel lengthens and narrows. Water that remains uncrystallized is theoretically mobile, but the thinness of the uncrystallized layer slows the transfer of significant volumes along such a narrow channel. In frozen soils, the narrowness of the individual channels is compensated by the extreme multiplicity of channels, making the Gibbs-Thomson effect significant for tranporting water (hence causing frost heave) at observable rates. In freeze-thaw weathering processes and in bedrock frost heave under periglacial conditions, ice segregation dependent on the migration of molecules mobilized via the Gibbs-Thomson effect is readily observable. The distances moved by the molecules are typically of the order of centimeters to tens of centimeters in these processes and time frames are of the order of months or years. It does not seem unreasonable therefore that a significant volume of H20 mobilized via the Gibbs-Thomson effect could migrate 10's or 100's of metres through frozen bedrock joints over time frames of decades or centuries. 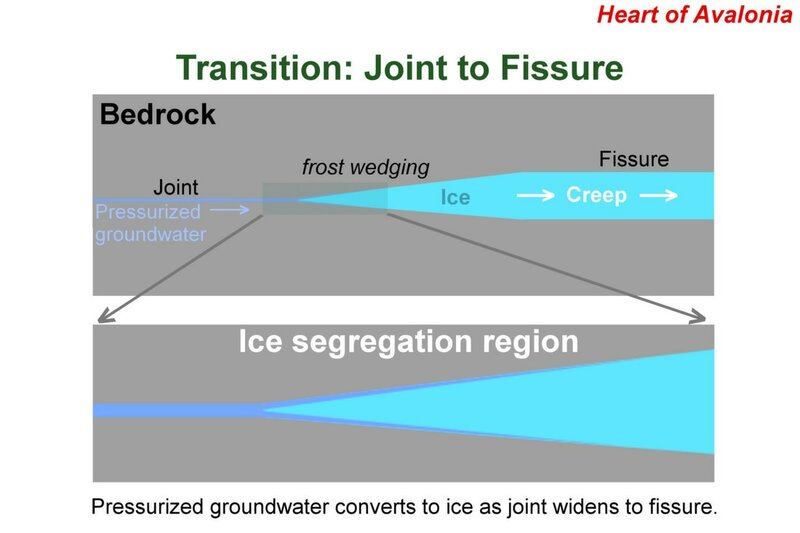 The diagram at the top of this section shows groundwater moving through a joint and then crystallizing onto an ice mass in a widened portion of the joint (widened joint is more appropriately termed a fissure). Assuming the surrounding bedrock is uniformly frozen (below pressure-melting point), the mobility of H20 in the narrow part of the joint would be attributed to the Gibbs-Thomson effect. The development of the fissure, where the joint becomes widened by frost wedging, would be attributed to the process of ice segregation. Movement of ice/water along the fissure could occur by a hybrid process of creep and the migration of uncrystallized water along the surface. Most observations of frost-heaved bedrock where a subglacial origin is suspected, show clear evidence of fissures intersecting the observed frost-heave occurrence. In summary, looking only at the issue of H2O mobility, the process of ice segregation augmented by ice creep in fissures, could theoretically account for the pressure transfer needed for bedrock frost heave to occur under a cold glacier. Volume rates for H2O transport would be low with this process and the corresponding hydraulic frost heave development would be very gradual.